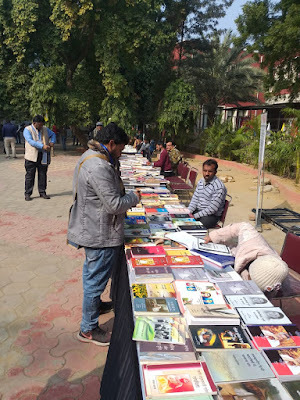 The two-day Dalit Literature Festuval at Kirori Mal College, Delhi University, has concluded with the slogan 'A new world of literature is possible'. The issues discussed included: past, present and future of Dalit literature; challenges of Dalit literature movement; contradiction between Dalit literature and Marxist literature; participation of Dalit and tribal women in literature; female movement in Dalit literature; tribal and nomadic communities in literature, society and culture; minorities’ and literature; question of identity in Dalit literature; and Dalit literature in Indian languages. During these discussions on the second day, Suraj Bahadur Thapa, while questioning the simplification of today's academic system, said, Marxists linked issues to class struggle, while Dr BR Ambedkar focused on class, caste and gender. Abdul Bismillah talked of roots of discrimination in languages, pointing towards how Urdu was considered a language of Muslims while Hindi or Sanskrit as language of Hindus. “Adivasis and Dalits are not being allowed struggle for water and forest. The government is still occupying our lands and forests. In the Pataldhari movement, we can see how our self-government efforts are being crushed, and the government is refusing to accept even the Constitution. But we will fight together and will also bring the voice to society on the right path, by voicing your voice vocally through literature”, Nirmala Putul said. Films on Dalit history and their struggles were screened during the festival, in which 12 publishers attended the book fair, which took placed simultaneously. 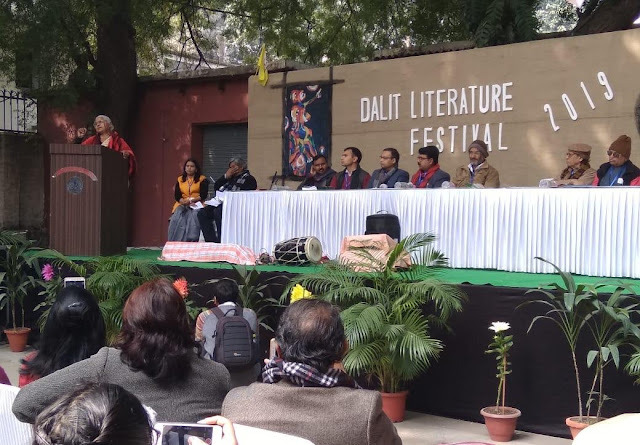 Other highlights of the festival included poetry recitation, discussion on how investigation was directed against Dalit writers and activists for the Bhima Koregaon violence early last year. In the two-day Dalit Literature Festival was attended, among others, by well-known social activist Medha Patkar, and writers from different parts of the country, including Laxman Gaikwad (Marathi), Mohandas Naimishrai and Balisingh Chima (Uttarakhand), Nirmala Putul (Jharkhand), Abdul Bismillah and Chauryaram Yadav (Banaras), Jai Prakash Sharmali Mustafa Khan and Jayashree (Thiruvananthapuram), (Trivandrum), Harish Mangalam and Haresh Parmar (Gujarati), Suraj Bahadur Thapa and Hare Prakash Upadhyay (Lucknow), Krantipal Singh, Balvir Madhopuri, Kesaram and Mohan Tyagi (Punjabi), and others.